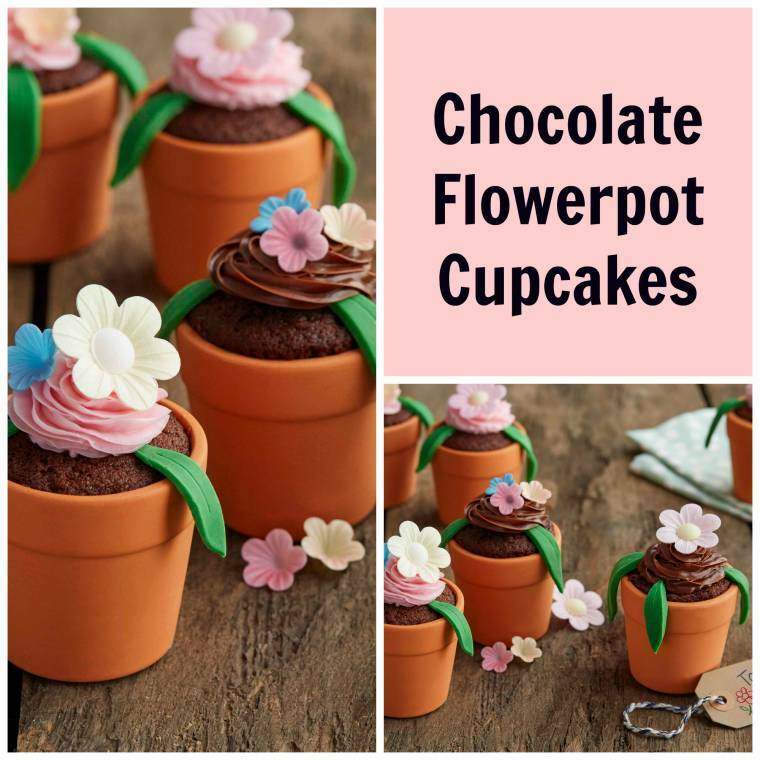 These Chocolatey Flowerpots are both pretty and tasty! A perfect treat for Mum on Mother’s Day! Line a cupcake tin with 10 cases, and preheat oven to 180⁰C. In a large mixing bowl cream together the butter and the sugar with an electric beater. Sift the flour, Dr. Oetker Fine Dark Cocoa Powder and Dr. Oetker Baking Powder into the mixing bowl. Add salt and Dr. Oetker Milk Chocolate Chips and gently fold in. Fold in 75ml of milk and the Dr. Oetker Madagascan Vanilla Extract in stages to make a smooth batter. Split mixture between 10 muffin cases or mini flower pots if you have them, then bake for 20 minutes. Once baked allow to cool for a couple of minutes. Put a squeeze of Dr. Oetker Surprise Inside Rich Chocolate Cupcake Centres into each cupcake and then allow to cool fully. Roll out the green Dr. Oetker Ready to Roll Green Regal Ice to approximately the thickness of a £1 coin. Carefully using a knife, cut out long thin leaves approx 5 – 7cm long and 1.5cm wide. Take 3 leaves and gently squeeze together at one end and place on top of cupcake. Use Dr. Oetker Pink or Chocolate Easy Swirl Cupcake Icing on top of each cupcake. Hold the can at a downward horizontal angle to the cupcake, place your finger on the nozzle and push across firmly. Decorate with Dr. Oetker Mini Wafer Flowers and Wafer Daisies. This recipe recipe, content and imagery was provided to me by Dr. Oetker to share. No Payment was received. "Lovely Strawberry Sandwich Cake: Mother’s Day Treat"
lovely…just in time for spring. Those look amazing!! Lovely cupcakes for spring! Wow, they look great! Thanks for sharing the recipe!